First of all let's talk about the packaging... in my opinion it's just stunning with a black print, gold accents and definitely a Gwen Stefani kind of style. Overall it may be made of plastic but I love the 1920's design along with the finer details. Like I mentioned above I chose the shade Wonderland for both lip products, which is described as a dark & vibrant pink-red shade. It suits my complexion perfectly and I would imagine that the shade would suit most skin tones. I can definitely see myself wearing this all throughout spring/summer for a touch of colour to a simple makeup look. 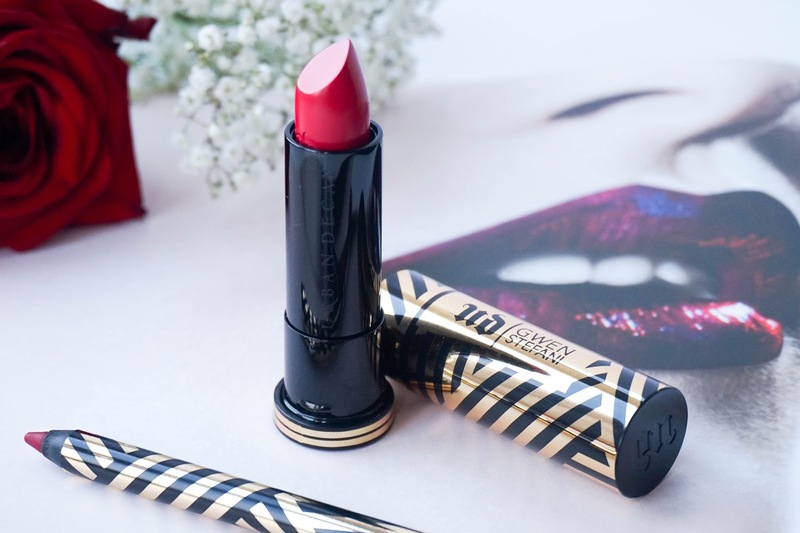 First up the Urban Decay X Gwen Stefani Lipstick* in Wonderland, which retails at £16 and is described as a cream. So of course the formula is very creamy and has an almost balm like texture, but that doesn't mean it lacks pigmentation. With just one swipe you have an intense & opaque colour payoff, not to mention that it just glides on the lips effortlessly. The shade is a medium red with cool pink undertones, so I personally find it super flattering. Due to the buttery, soft formula it feels really comfortable to wear and doesn't dry out my lips. I do think it's best worn with a lip liner underneath to prevent feathering and for maximum wear time. When I personally wore it with the matching lip liner it lasted a good 5 hours, throughout snacking & drinking, leaving an even stain effect behind. 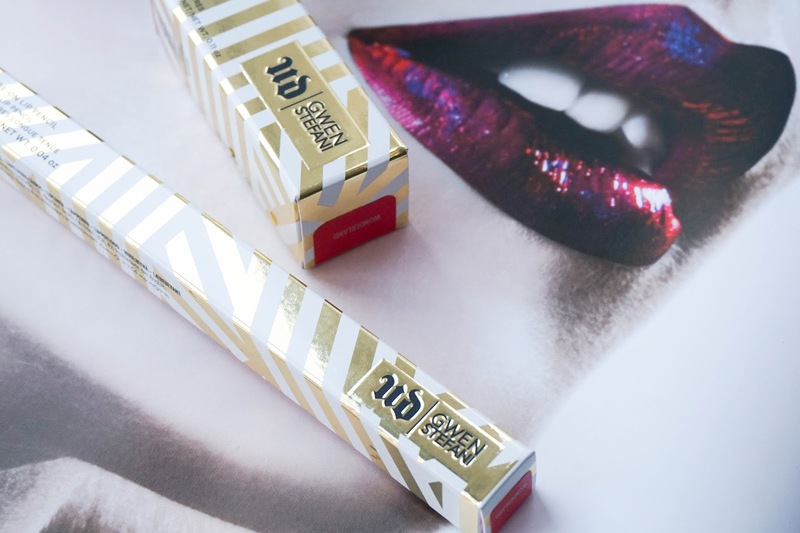 I'm so impressed with this lipstick including the packaging, formula & wear time, that I am very tempted to pick up a few more shades before they sell out. 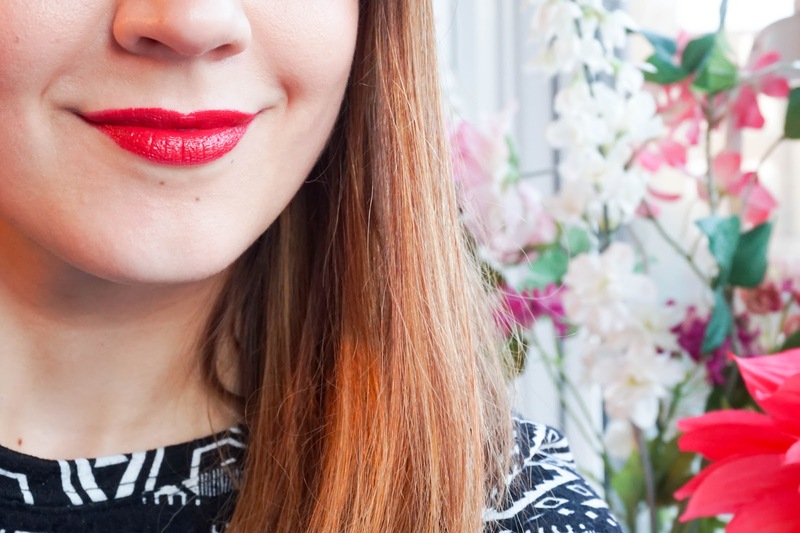 Definitely a lipstick you should check out before it's too late. 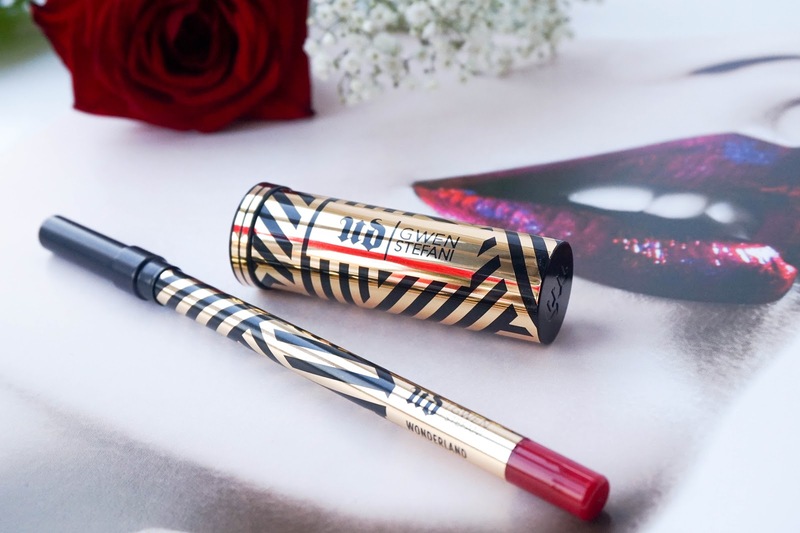 Next up the Urban Decay X Gwen Stefani Lip Pencil* in Wonderland, which retails for £14 and it's basically the matching liner to the lipstick above. This is my first high end lip liner, because yes I am a cheapskate and only own budget brands when it comes to liners. So I was eager to see if there would be a huge difference between this and my favourite Rimmel liners for example. 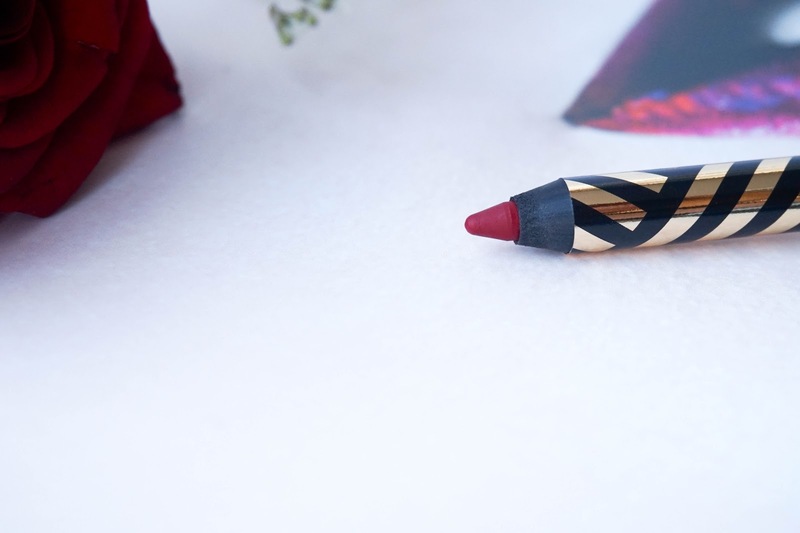 The lip pencil has the same medium fuchsia-red kind of shade as the lipstick, but has a matte finish instead of a creamy one. Worn on it's own I could see this drying out my lips, but it's perfect paired with the lipstick. 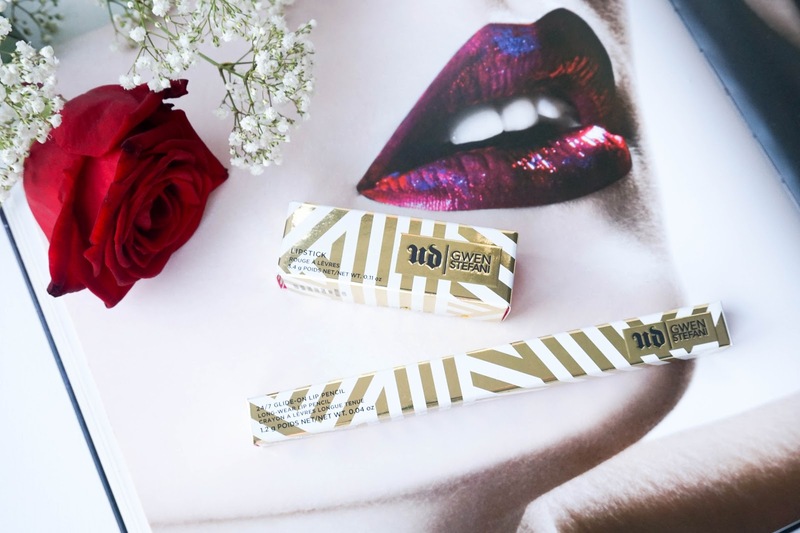 It provides a great base & really helps the longevity of the lip colour. 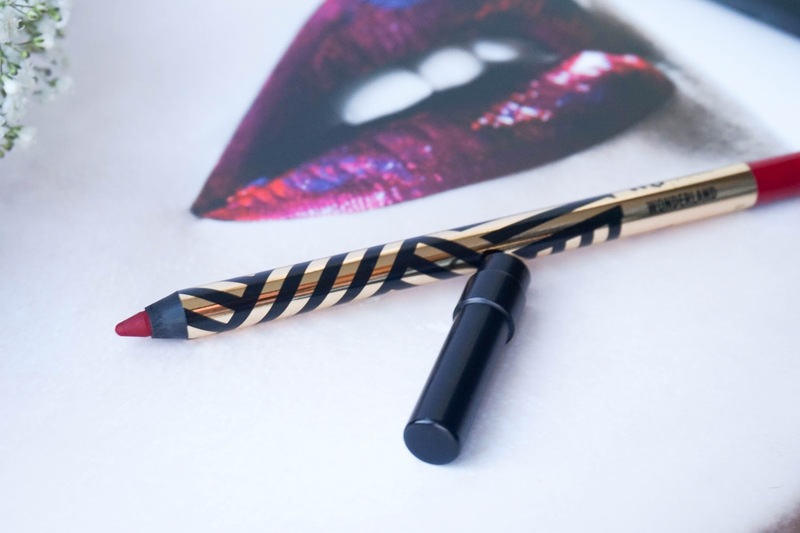 However I can't see much of a difference in terms of quality between this and my budget versions... so I would say if you have similar shades in your lip liner collection than opt for another lipstick instead. As you can see above that's how the duo looks on my lips and I just love the vibrant red shade with pink undertones. This lip range, in particular the lipsticks are faultless in my opinion and definitely worth looking into. 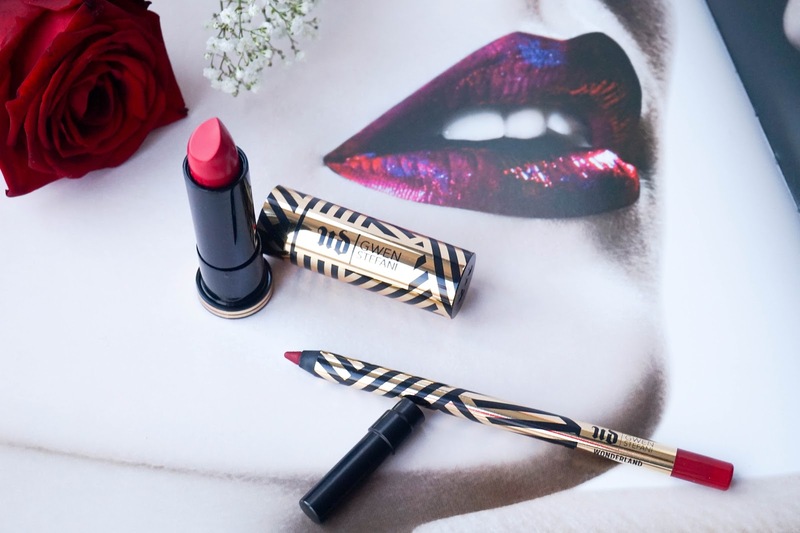 Even though the collection is limited edition, House of Fraser still have the whole range available if you're looking to get your hands on any of the products. 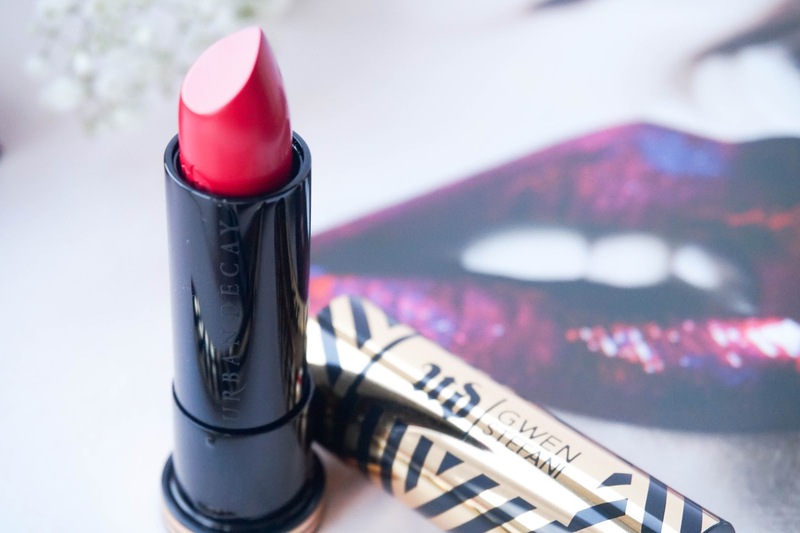 I'd love to hear your thoughts on this lip duo and if you've tried anything from the Urban Decay X Gwen Stefani range?